With Sensor Tower’s App Intelligence and Usage Intelligence products, you can find apps your targeted users are engaging with and discover keyword ideas from these relevant apps. These keywords will be terms your targeted users are most likely searching for in the App Stores. With this help document, you’ll learn how to utilize our App Overlap feature to find apps that your users are more likely to use. With Keyword Spy you can find the keywords these apps are currently ranking for in the App Stores. These apps will not be direct competitors, but apps whose users are more likely to use your app than the average user. Targeting these keywords will ensure a high-quality user-base because these terms are typically displayed to users who are more likely to engage with your app. In App Overlap, you can view the specific apps whose users are more likely to use your app and which apps your users are more likely to use in conjunction with your app. With this data, you can analyze where your app's user-base spends their time and which apps your targeted users are currently utilizing. To find the relevant apps for Pinterest’s users, follow the steps below. *Note: You can view any App in App Overlap using these steps. Go to App Overlap within Usage Intelligence. Enter Pinterest in the search bar. You will now be able to see the apps whose users are more likely to use Pinterest. This feature gives Pinterest an idea of where to target ASO campaigns because these users are more likely to use Pinterest than the typical user. For example, Fitbit users are 27 percentage points (p.p.) higher than the average person to use the Pinterest app. Indicating that Pinterest can target Fitbit’s users because a Fitbit user is 27 p.p. more likely to use Pinterest than the average user. With Keyword Spy, you can view all the keywords a selected app is currently ranking for side-to-side to your own app’s keywords. Keyword Spy helps you evaluate keywords and keyword selection strategies from any app in the App Stores. Using Keyword Spy, alongside App Overlap, you can find the keywords from the apps whose users are more likely to use your app. Once you have found the relevant apps for your app outlined in the Finding Related Apps section above, you can use Keyword Spy to discover the keywords these relevant apps are currently ranking for. To find new keywords for Pinterest to target using the top two apps from App Overlap, Fitbit and Tumblr, follow the steps below. *Note: You can change the apps within Keyword Spy at any time for different results. 1. 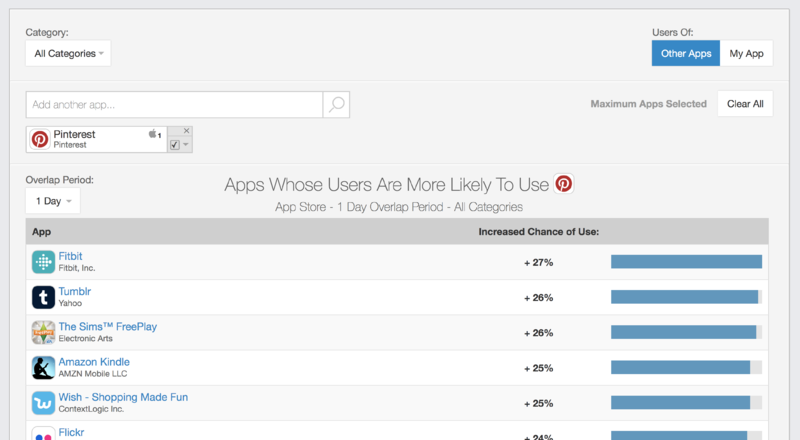 Go to Keyword Spy in App Store Optimization within App Intelligence. *Note: Make sure you have added your app with the green Add New App icon at the top of the page. Enter Fitbit into the left search bar under the question mark icon and hit enter. 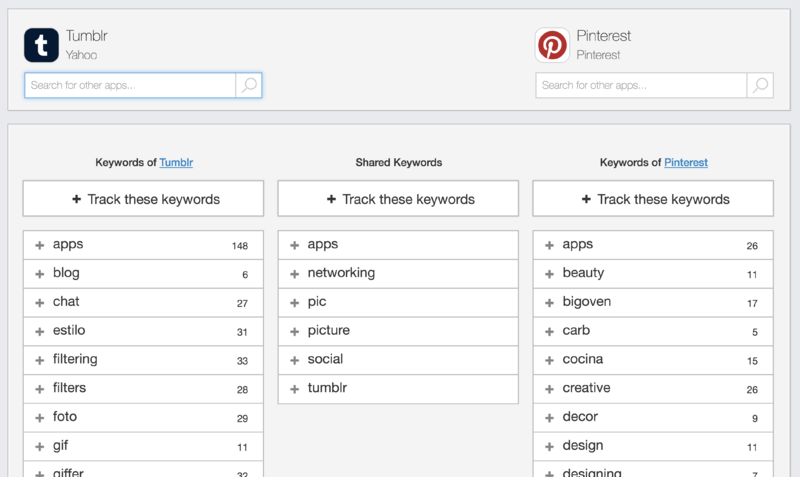 You will now be able to see the keywords Fitbit is currently ranking for and the keywords Pinterest is ranking for. Viewing this list, select a few keywords from Fitbit to track in Keyword Rankings by clicking directly on the plus sign icon next to the keyword from the page. Enter Tumblr into the search bar under the Fitbit icon and hit enter. Using these steps, you can find potential keywords from relevant apps whose users are more likely to use your app. These keywords are directed to your targeted userbase because your targeted users are more likely to use these keywords from relevant apps in their searches. Once you have reviewed the keywords most relevant to your own app and added them to your keyword string, begin tracking the keywords in our Keyword Rankings feature.